LANXESS inorganic pigments have brought beauty and sustainability to sports arenas, popular landmarks and urban infrastructure such as streets, sidewalks and plazas all over the world for decades. 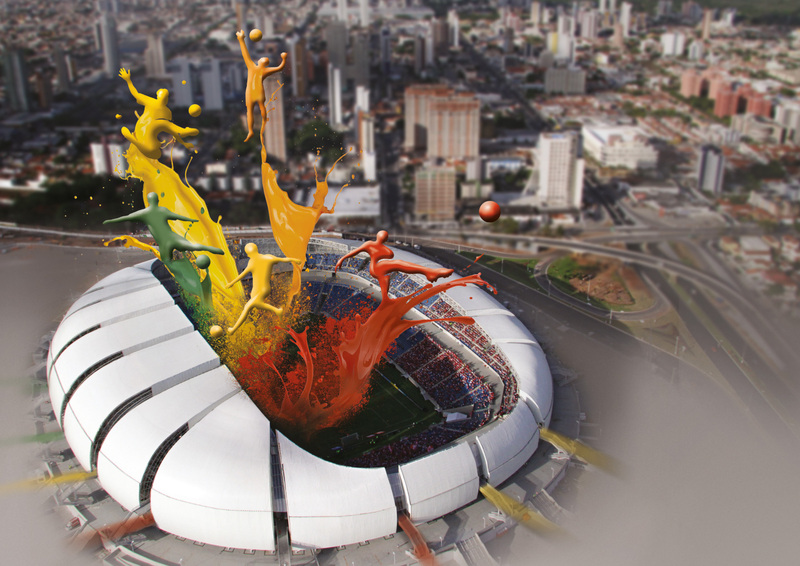 In Brazil, the specialty chemicals company is part of the game as well: more than 120 metric tons of inorganic pigments, marketed under the brands Bayferrox and Colortherm, can be found there in architectural and infrastructure projects, bringing color to the world's biggest soccer event. One example is the Arena das Dunas in Natal City on the coast of the Brazilian state of Rio Grande do Norte. The yellow and brown LANXESS pigments Bayferrox 918LO, Bayferrox 601 and Bayferrox 975M were used in the colored concrete pavers surrounding the stadium that give it such a bright and friendly atmosphere. Another example is the Pantanal Arena, located in Cuiabá, a town with around 550,000 inhabitants. The population of Brazil call this the “green city” because it is in the north of one of Brazil's most important ecosystems (the so called Pantanal) and has a high proportion of green areas. In designing the new multi-functional sports arena, the planners therefore implemented an environmentally friendly concept. This includes the recycling of the rubble generated and the use of construction timber from sustainable sources. The sustainably produced yellow pigment Bayferrox 921 fits this concept perfectly. The concrete slabs in warm and friendly yellow shade are an attractive feature of the stadium's forecourt and help the arena fit in harmoniously with its natural environment. LANXESS' inorganic pigments bring color to otherwise drab concrete and also have excellent light, weather and chemical resistance. “Another great advantage of using through-colored concrete is the low maintenance cost over a long period of time,” explains Dr. Hans-Peter Baldus, head of the Inorganic Pigments (IPG) business unit in the Americas region. The use of a conventional paint would not have been appropriate due to the Brazilian climate, with its hot sun, heavy rain and high moisture, and would have necessitated extensive maintenance over time. Besides being present in stadiums such as Arenas das Dunas, Pantanal, Maracanã and Mineirão, Bayferrox also brings color to several urban projects in Brazil. For example, Bayferrox brightens up the new Luiz Gonzaga Museum, which is in the Cais do Sertão tourist complex in the state of Pernambuco in Northeast Brazil. Architects Marcelo Ferraz and Francisco Fanucci, responsible for the project chose the LANXESS pigment Bayferrox 975M to color the concrete because it best matched the original ocher shade of Sertão’s sandstone. “We wanted a material that represents the sandstone of the region and that contrasts with the white lacy latticework that covers parts of the facade,” says Ferraz. More information on LANXESS inorganic pigments can be found at www.bayferrox.com. The Inorganic Pigments business unit is part of LANXESS’ Performance Chemicals segment, which achieved sales of EUR 2.13 billion in fiscal 2013.